Easter Seals Nevada provides exceptional services to help all people with disabilities or special needs and their families become self-sufficient through direct services, education and community partnerships. is a network of individuals with Down syndrome, their parents, families and friends. 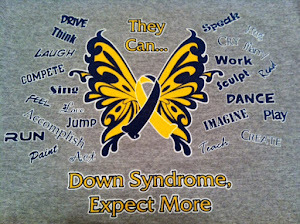 The mission of the DSNNN is to create a positive understanding of Down syndrome. We provide events, information, education, and awareness as we advocate for full community inclusion of people with Down syndrome and their families. Down syndrome is the most commonly occurring genetic condition. One in every 733 births is a baby with Down syndrome. There are over 350,000 people with Down syndrome in the United States alone, accounting for 5,000 to 6,000 births a year. PDOP was founded by two parents who have disabled children. It wasn't long after their children were diagnosed with a disability that these two parents found out that there was no local support for them here in Pahrump. There were no groups for parents or family members. There was limited information in the community regarding the disabilities. The greatest wish of every expectant parent is to bring a healthy child into the world. Recent studies indicate, however, that every year, 6% of children are born with a neurogenetic condition such as Williams Syndrome, Down Syndrome, or Autism. As a legacy to Lili, The Lili Claire Foundation helps to ease the challenges these families face by providing a unique and comprehensive blend of support services through our Lili Claire Family Resource Centers, operated in partnership with the finest university hospitals across the country.